Brian Barnes is bent on one knee in the middle of his office floor at the University of Alaska in Fairbanks. Before him is a red-and-white cooler — the kind you stuff with hot dogs and beer for camping trips. 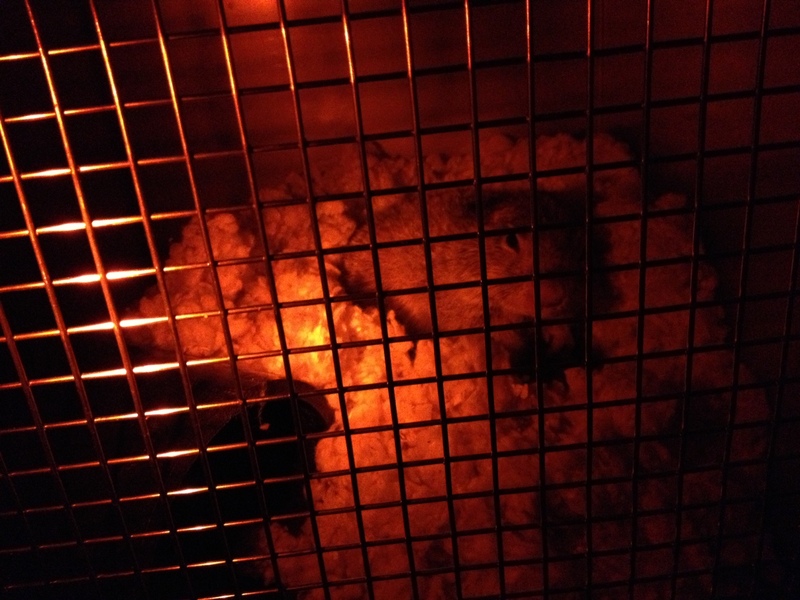 But inside this cooler is a very cold squirrel, snugly burrowed into wood chips with sawdust sprinkled on top. If the squirrel had moved at all in the past day or so, the sawdust would show it. There are no signs of disturbance. The squirrel is hibernating in its hard plastic den. 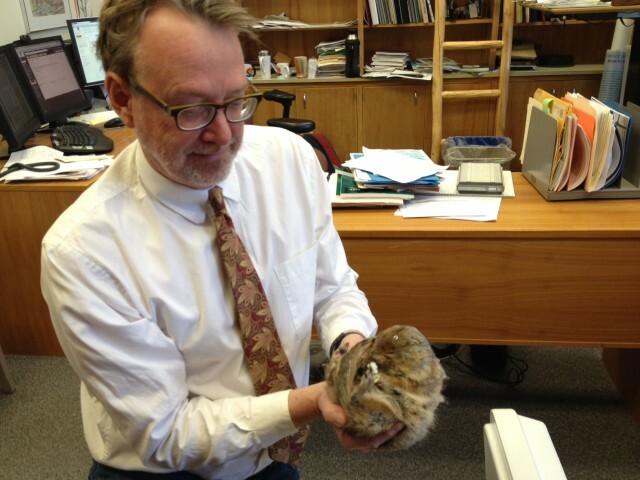 Barnes, Director of the Institute of Arctic Biology at UAF, picks it up and hands it to me, as he likes to do with visitors to his office (one former guest referred to it as his favorite parlor trick). “This is the typical posture,” Barnes says. “They pull their tail over their head, close their eyes and crawl in a ball.” Though the squirrel’s brainwaves are currently switched off, as Barnes has shown by placing electrodes on the brains of squirrels and recording electrical signals through a test called EEG (electroencephalograms), the warmth of my hands sparks an internal trigger. The squirrel begins to unfurl. This kind of rewarming occurs spontaneously every one to three weeks in hibernating squirrels and brings their body temperature, heart rate and metabolism back up to normal levels. Barnes is essentially trying to figure out why squirrels bother to spend valuable energy revving up their bodies and brains, only to fade to black again after a few hours. A love for biology runs in Barnes’ family. He grew up nearby to the University of California Riverside, where his father built an esteemed 45-year career as an entomologist who once discovered a better way to prune grapes that saved untold bottles of wine from turning bad on the vine. “The idea of being a professor was already very comfortable for him,” Jim Kenagy, biologist and Barnes’ former doctoral advisor at the University of Washington, says of Barnes. He began his undergraduate studies in biology at UC Riverside and during his time there, fortuitously landed a gig as a squirrel caretaker in a research lab. Then, upon completing his doctorate with Kenagy and postdoctoral research on golden-mantled ground squirrels, he moved to Alaska in 1986. It was there that he met the Arctic ground squirrel, and they’ve been working together ever since. The Arctic ground squirrel is one of the largest squirrel species, and lives farther north than any other small hibernating mammal in North America (and even further north than caribou). Since his own move north, Barnes and Team Squirrel (as he calls his collaborators) have recorded the lowest body temperature of any living mammal — 26.6 degrees Fahrenheit — in an Arctic ground squirrel, and helped define what we know about built-in arctic survival strategies. Kenagy says Barnes’ research is particularly significant because he tests his theories in the wilds of Alaska as well as in his lab. “His most elaborate and beautiful measurements have been lab studies, always backed by the fact that we know this is something going on in the field,” says Kenagy. Barnes’ work — not just on squirrels, but also on the overwintering strategies of insects, frogs and black bears — continues to be cited by thousands of researchers. Even so, Barnes is still more likely to speak in questions than in answers. As he talks science in his office, he occasionally turns to scrawl diagrams of metabolic cycles in blue and red lines on a marker board. Today, he is most intent on sharing his knowledge of this squirrel’s brainwaves and the rise-and-fall rhythm of its fascinating hibernation cycle, which has left researchers like Barnes wondering what, exactly, controls the unusual brain patterns of a hibernating squirrel. “Everything we do is controlled by clocks,” Barnes starts. Clocks like circadian rhythms, which are built-in timekeepers that dictate the natural daily cycles of an organism. They evolved as a result of living on a planet that spins on an axis with a distinct night and day. Even so, his team hypothesized that circadian rhythms have nothing to do with the periodic rewarmings that occur like clockwork in hibernating squirrels — which might have been the obvious first guess. If these rhythms evolved with sun cycles, shouldn’t they get out of whack when a squirrel buries itself underground and shuts its eyes from September to April? “There’s something working in there, in the brainstem most likely,” Barnes says. Team Squirrel is sampling the brains of squirrels as they hibernate and rewarm to try to determine whether the genes responsible for generating circadian rhythms are active during winter, and if not, what causes them to switch back on again around this time each spring. To do this, researchers first inject arctic ground squirrels with antibodies that bind to proteins in the brain involved in the firing of neurons (these proteins are known to be affiliated with circadian rhythms). Then they inject another chemical to freeze the proteins and antibodies in place. Finally, they euthanize squirrels at different stages of a rewarming bout to look for these proteins in slices of the squirrels’ brains. If it turns out that these rhythms aren’t causing these periodic rewarmings — what is? Counterintuitively, Barnes thinks that squirrels might actually get sleepy while hibernating since sleep requires brainwaves that are entirely switched off during hibernation. His theory is that a squirrel rouses from hibernation to snooze, only to hibernate again after a quick nap. Barnes has shown that squirrels do sleep during rewarmings, although he hasn’t yet been able to prove that sleep is the primary reason such warmings occur. Should this be the case, it could add to scientists’ understanding of why mammals need to sleep and carry other human health implications. Past research from Barnes’ lab has already provided clues for treating Alzheimer’s disease, since squirrels have the remarkable ability to regenerate neural connections in their brains that are lost during hibernation, similar to those that go missing in the brains of Alzheimer’s patients. Different research has inspired a new look at ways to treat heart attacks and strokes, as doctors could minimize damage to victims by lowering the energy demand in their bodies as squirrels do during hibernation. All told, Barnes has been studying hibernation for 37 years. There’s no shortage of science yet to come as important questions remain on circadian rhythms, sleep and how hibernation can help human health. As for Barnes? He is just as happy to pose these questions as to publish the answers. Thanks! A lot of people do not ralziee the cash that it takes, the time to prepare, do it, edit it down, add water marks and other things, etc. And to release 5 per week religiously? If I miss a day people know. Its why I snicker over a few things. Im burned our after 2 years of this and have another 100 vids to film of unique topics.